© 2010 Plant Management Network. Accepted for publication 28 January 2010. Published 26 May 2010. Byamukama, E., Robertson, A. E., and Nutter, F. W., Jr. 2010. Quantification of temporal and spatial dynamics of Bean pod mottle virus at different spatial scales. Online. Plant Health Progress doi:10.1094/PHP-2010-0526-03-SY. Bean pod mottle virus (BPMV) is the most prevalent virus infecting soybean (Glycine max) in the United States; however, the temporal and spatial dynamics in BPMV at varying spatial scales has not been elucidated. To quantify the temporal and spatial dynamics of BPMV at a field scale, a quadrat-based method was developed in which six soybean rows, each consisting of 30-cm-long quadrats, were established within soybean cv. NE3001 field plots (i.e., 150 quadrats per plot) in BPMV-inoculated and non-inoculated plots. Quadrats were sampled by selecting the youngest fully expanded leaflet from each of four plants within each quadrat beginning 25 days after planting, and continued at 8- to 11-day intervals until crop senescence. Leaf sap was extracted from each 4-leaflet (bulked) sample (from each quadrat), and tested for presence of the BPMV by ELISA. Quadrat position (plot, row, and quadrat number) and the date of sampling that each quadrat first tested positive for BPMV was recorded and mapped. The rate of BPMV incidence in 2006 ranged from 0.09 to 0.12 logits/day, indicating that BPMV incidence was doubling every 5.3 to 7.7 days in 2006. Doubling times for BPMV incidence in 2007 were slower, ranging from 17.3 to 34.7 days. Analysis of spatial patterns using ordinary runs revealed that BPMV-infected quadrats were predominantly clustered within both BPMV-inoculated and non-inoculated plots throughout both growing seasons. In addition to within field plot studies, a three-year statewide disease survey (2005-2007) was conducted in Iowa to quantify county and field scale BPMV prevalence and incidence by systematically selecting 30 plants/soybean field (8 to 16 soybean fields per county). Leaf samples were then tested for BPMV by ELISA and county-level BPMV incidence maps were generated using ArcGIS software. End-of-season BPMV prevalence was 39/96 counties in 2005 (40%), 90/99 counties in 2006 (90.1%), and 74/99 counties in 2007 (74.7%). The incidence of BPMV within Iowa counties ranged from 0 to 100% and BPMV incidence significantly increased statewide from north to south. Spatial autocorrelation (dependence) analysis using Morans I revealed clustering for BPMV incidence among Iowa counties, indicating that BPMV incidence among counties was not random. The elucidation of the within-field temporal and spatial dynamics of BPMV and the statewide geographic distribution of BPMV in Iowa has important implications with regards to sampling, plant disease forensics, BPMV management, and risk prediction of BPMV. 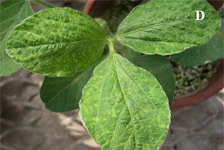 Bean pod mottle virus (BPMV) is the most prevalent virus affecting soybean in the United States, and is reported to be present in all major soybean production areas (7). Recently, BPMV has been perceived to be at epidemic levels in the North Central region of the United States (25). Bean pod mottle virus has been reported to cause up to 52% yield loss, depending on time of infection and soybean cultivar (1,5,10,16,24). In addition, BPMV has also been shown to adversely affect seed quality by discoloring the seed coat (9). Resistance for BPMV in soybeans has not been reported (2,7,23,29). The predominant vector of BPMV is the bean leaf beetle, Cerotoma trifurcata (Forster) (Coleoptera: Chrysomelidae) (2,6,11,22) (Fig. 1). This vector is responsible for both survival and dissemination of BPMV within and among soybean crops (6). Bean leaf beetle populations have been on the increase in Iowa, with the highest population density (230 bean leaf beetles per 50 sweeps) being recorded in 2002 (3,7,11,13). Potential sources of initial inoculum of BPMV include overwintering bean leaf beetles, BPMV-infected soybean seed, and/or perennial alternative weed hosts (12,14). However, levels of initial inoculum from these sources have been very low. Research by Krell (12) found that only one out of 194 overwintering bean leaf beetles could successfully transmit BPMV to healthy soybean plants. In the spring of 2007 in Iowa, we found that just 4 of 502 bean leaf beetles could successfully transmit BPMV to healthy soybean plants (unpublished data). At present, the role and importance of alternative weed hosts infected with BPMV is unknown (21). Although the levels of initial inoculum in both bean leaf beetles and seed have been reported to be relatively low, when extrapolated over field-level spatial scales (e.g., hectare), the frequency and spatial distribution of BPMV infected plants may still be sufficient to initiate severe BPMV epidemics. For example, if just 0.013% soybean seed is infected with BPMV per hectare, this would result in approximately 32 BPMV-infected seedlings out of about 250,000 seedlings per hectare and these infected plants would be randomly distributed within each hectare. Based upon bean leaf beetle population density of one bean leaf beetle per meter of row, one hectare of soybeans would harbor approximately 10,000 bean leaf beetles, of which (based upon previous estimates) approximately 50 bean leaf beetles would be viruliferous. Combined, these two sources of BPMV initial inoculum may be sufficient to initiate BPMV epidemics, if the rate of plant-to-plant spread by bean leaf beetles is high. To date, however, quantitative data concerning the actual rate of BPMV infection remains largely unknown. Fig. 1. (A) Bean leaf beetle feeding on soybean leaf, and (B) early feeding on young soybean plants at VE-VC growth stage. 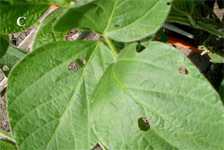 (C) Oval holes, characteristic of bean leaf beetle feeding, and (D) symptoms of BPMV on soybean leaf. In his 1963 book, Vanderplank stated that "the chemical industry and plant breeders have forged fine tactical weapons; but only epidemiology sets the strategy" (28). Only when integrated disease management tactics are implemented with a knowledge-based strategy can effective disease management programs be obtained (20). Quantifying the temporal and spatial dynamics of BPMV is thus relevant to improved disease management. Such quantitative knowledge would also be extremely useful in plant disease forensics to help determine if a pathogen was introduced deliberately or by natural biological events. Therefore, the objectives of this study were to: (i) quantify the temporal and spatial dynamics of BPMV within soybean fields, when BPMV is deliberately introduced into soybean field plots versus naturally-occurring epidemics (non-inoculated); (ii) quantify the temporal and spatial dynamics of BPMV prevalence and incidence at the county scale; and (iii) produce BPMV incidence risk maps at the county scale that depict areas of high versus low BPMV risk within Iowa. Experimental plots were established at the Iowa State University Curtiss Research Farm in Ames, IA, on 5 May 2006 and on 18 May 2007. The soybean variety NE3001, which is susceptible to BPMV but tolerant to Soybean mosaic virus (8), was planted. Soybean plots consisted of six rows that were 7.62 m long with a row spacing of 0.76 m. Soybean plots bordered by the same cultivar and plots were spaced at least 15.2 m apart from one another. The six center rows of each plot were subdivided into 150 30-cm-long quadrats (six rows × twenty-five 30-cm quadrats/row = 150 quadrats/plot) using 22.8-cm white wooden stakes (Fig. 2A). Soybean plants within quadrats were thinned to four plants per quadrat (Fig. 2 B). Fig. 2. (A) Demarcation of soybean quadrats using 12-inch stakes (25 quadrats per row, six rows per plot). (B) Thinning of soybean plants, each quadrat had 4 soybean plants. (C) ELISA plate showing positive wells (yellow) and negative wells (clear). ELISA was used to detect BPMV. Two treatments were imposed: (i) BPMV-inoculated point sources were deliberately introduced into the center of plots; or (ii) plots were not inoculated to mimic natural infection. 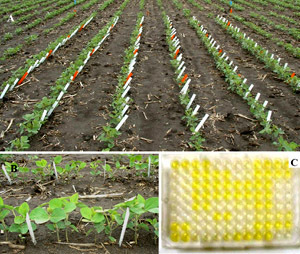 For inoculated plots, soybean plants located in the 13th quadrat position of the center two rows were mechanically inoculated on 30 June with sap extracted from greenhouse-grown BPMV-infected soybean plants. Treatments were arranged in a randomized complete block design with three replications. Soybean leaves within each 30-cm quadrat were sampled at 8- to 11-day intervals, beginning 24 days after planting. Each quadrat within each plot was sampled by removing the youngest, fully-expanded trifoliate leaf from each plant as previously described (17,25). All leaflets from each quadrat were placed into pre-labeled plastic sandwich-size bags, and stored at 4°C until sap extraction. Plant sap was extracted from each four-leaflet soybean sample (quadrat) using a leaf press (Ravenel Specialties Corp., Seneca, SC). Plant sap was diluted by adding 1 ml of general extraction buffer, pH 7.4, and extracted sap was stored in 1.5-ml microcentrifuge tubes at -20°C until testing by ELISA (Fig. 2C). Quadrat samples were considered positive for BPMV if the absorbance value of a sample was greater than twice the value of the mean of the negative controls. The percentage of soybean quadrat samples testing positive over time for BPMV for each treatment was plotted with respect to date of sampling. The row and quadrat position of each individual quadrat testing positive for BPMV was mapped. Incidence of BPMV-infected quadrats was then plotted against time of sampling to obtain pathogen progress curves. Population growth models (linear, monomolecular, exponential, logistic, and Gompertz) were evaluated for model fit based on the F-statistic for the each model, the coefficient of determination (R²), the standard error of the estimate for pathogen incidence (SEEy) and a visual evaluation of standardized residual plots (18,19). The resulting BPMV spatial pattern maps were analyzed to determine if BPMV incidence within soybean plots was random or clustered using ordinary runs analysis (15,18). A state-wide soybean disease survey was carried out in Iowa for 2005, 2006, and 2007. Eight-to-sixteen soybean fields per county were sampled at growth stages V2-V3, R1-R2, R4-R5, and R6-R7 from all 99 counties (with the exception of 3 counties in 2005). For each soybean field sampled, GPS coordinates, soybean cultivar, previous crop, neighboring crops present, the presence or absence of bean leaf beetles, and growth stage were recorded. A systematic sampling design (modified "W" with 10 arms) was used to collect 30 soybean plants from each field. The plants were uprooted and mailed overnight to Iowa State University, kept in a cold room (4°C), and later tested for the presence of BPMV. This was accomplished by removing the middle leaflet of the topmost fully expanded leaf from each plant (30 leaflets). The 30 leaflets from each field were then stratified into 6-leaflet subsamples (i.e., there were five 6-leaflet subsamples from each soybean field). Subsamples were then labeled and stored in plastic zip-lock bags at 4°C until leaf sap was extracted and tested for BPMV using ELISA. County BPMV incidence (defined as the number of sub-samples testing positive for BPMV within a county, divided by the total number of soybean subsamples tested within a county × 100) was mapped using ArcGIS software (ESRI, Redlands, CA). The relationship between average BPMV incidence in a county tier in relation to tier latitude (counties aligned on the same latitude) was investigated by linear regression (there are nine county tiers in Iowa). In 2006, the onset of BPMV epidemics, defined as the day of year when 5% of soybean quadrats tested positive for BPMV, occurred on day of year 193 (12 July) for BPMV-inoculated plots and on day of year 181 (30 June) for non-inoculated plots. In 2007, however, BPMV epidemic onset occurred on day of year 200 (20 July) in BPMV-inoculated plots and day of year 235 (23 August) in non-inoculated plots (Table 1). Final incidence of BPMV on the last date of sampling in 2006 (day of year 229, 17 August) for inoculated and noninoculated soybean plots was not significantly different (91.6% and 90.0%, respectively). In 2007, the final BPMV incidence on day of year 244 (1 September) in BPMV-inoculated plots was 35.6%, compared to 10.0% in non-inoculated plots (Fig. 3A and 3B). The earlier a soybean plot was found to have one or more soybean quadrats that tested positive for BPMV, the higher the final BPMV incidence at the end of season in both 2006 (F = 14.52, P = 0.02, R² = 88.6%), and 2007 (F = 41.64, P = 0.003, R² = 95.5%) (Fig. 4). Table 1. Day of year for Bean pod mottle virus (BPMV) epidemic onset (operationally defined as the time to 5% BPMV incidence) for inoculated and non-inoculated plots in soybean cv. NE3001 planted at the Iowa State University Curtiss Research Farm, Ames, IA, in 2006 and 2007.
x No statistical difference between treatments. y Treatments followed by different letter within the same column are significantly different (P < 0.05) using ANOVA and a Tukey test for mean separations. Fig. 3. Progress of Bean pod mottle virus (BPMV) incidence in soybean (cultivar NE3001) planted at Iowa State University Curtiss Research Farm in 2006 (A), 2007 (B), and relationship between logit BPMV incidence and day of year soybean quadrats were sampled in soybean (cv. NE3001) quadrats planted at Iowa State University Curtiss Research Farm, Ames, IA, during 2006 (C), and 2007 (D). Fig. 4. Relationship between final Bean pod mottle virus (BPMV) incidence and day of year when BPMV was first detected in a plot during the 2006 (solid circles) and 2007 (open circles) soybean growing seasons. The logistic model provided the best fit for pathogen (BPMV) progress curves in both years (Figs. 3C and 3D). Using this model, coefficients of determination (R²) ranged from 94.3 to 98.3%, indicating that day of year explained 94.3 to 98.3% of the variation in logit BPMV incidence. The rates of BPMV infection in the BPMV-inoculated treatment (r = 0.12 logits/day) versus the non-inoculated treatment (r = 0.09) logits/day) were not significantly different (P > 0.05) in 2006. Rates of BPMV infection, however, were significantly slower (P < 0.0001) in 2007 (r = 0.05 logits/day in BPMV-inoculated plots and r = 0.07 logits/day in non-inoculated plots), compared to 2006. At these rates, BPMV epidemics in 2006 were doubling every 5.3 days in BPMV-inoculated plots and every 7.7 days in non-inoculated plots (28). Doubling times in 2007 were every 13.9 days in the BPMV-inoculated plots and every 9.9 days in non-inoculated plots. Examples of spatial maps depicting the positions of quadrats within rows and sampling dates when soybean quadrats first tested positive for BPMV are shown in Figures 5 and 6. Yellow quadrat indicates soybean quadrats that tested positive for BPMV, and numbers within each yellow quadrats depict time of sampling when each quadrat first tested positive for BPMV. Green quadrats indicate that BPMV was not detected in those quadrats throughout the growing season. Using ordinary runs analysis, the spatial pattern of BPMV-infected quadrats was mostly clustered in both BPMV-inoculated and non-inoculated treatments (Table 2). Although BPMV was not detected in the non-inoculated treatment until the 8th sampling date in 2007, the spatial pattern of BPMV-infected quadrats after this time were also clustered (non-random) for all subsequent sampling times. Table 2. Ordinary runs analysis of z-score values for analysis of spatial patterns of Bean pod mottle virus (BPMV) infected quadrats within soybean plots (cv. NE3001) planted at the Iowa State University Curtiss Research Farm, Ames Iowa, in 2006 and 2007. Fig. 5. Spatial maps depicting the spatial spread of Bean pod mottle virus (BPMV) at various sampling times within NE3001 soybeans in 2006 in non-BPMV-inoculated plot. Yellow quadrats depict the detection of BPMV and the green quadrats depict the non-detection of BPMV. Spread of BPMV within plots is depicted over successive sampling times by numbers within boxes that indicate the sampling period in which BPMV was first detected in a soybean quadrat. Fig. 6. Spatial maps depicting the spatial spread of Bean pod mottle virus (BPMV) at various sampling times within NE3001 soybeans in 2007 in BPMV-inoculated plot. Yellow quadrats depict the detection of BPMV and the green quadrats depict the non-detection of BPMV. Spread of BPMV within plots is depicted over successive sampling times by numbers within boxes that indicate the sampling period in which BPMV was first detected in a soybean quadrat. Fig. 7. Incidence of Bean pod mottle virus (BPMV) in Iowa counties during the soybean growing season of 2005 (A), 2006 (B), and 2007 (C). Table 3. Spatial analysis for spatial dependence using Morans I for BPMV incidence among Iowa counties in 2005, 2006, and 2007. Fig. 8. Average county tier Bean pod mottle virus (BPMV) incidence plotted with average county tier latitude for 2005, 2006, and 2007. Quantifying the temporal and spatial dynamics of a pathogen population over the course of an entire growing season can provide critical quantitative information regarding the time of epidemic onset, changes in the spatial pattern over time, and the rate of change of disease intensity with respect to time. This research provides valuable, new, quantitative epidemiological information concerning the temporal dynamics and spatial patterns of BPMV epidemics and the relative importance of BPMV infected seed versus viruliferous bean leaf beetles as potential sources of initial inoculum (18,20,25). In the BPMV pathosystem, the clustered nature of BPMV and temporal dynamics suggest that sampling to quantify prevalence and incidence of BPMV should be done between the V3 and R3 growth stages. Sampling conducted prior to the V3 growth stage would indicate the likely incidence of BPMV infection resulting from seed-to-seedling transmission versus transmission by overwintering infested bean leaf beetles that would occur one latent period after crop emergence. In our study, only a single soybean quadrat out of 1,800 quadrats (for both years combined) tested positive for BPMV, indicating that only this one quadrat could have been the result of seed-to-seedling transmission. Therefore, it must be assumed that all soybean quadrats testing positive for BPMV after the first sampling date were likely the result of BPMV transmission by bean leaf beetles. Moreover, to avoid bias in sampling, the choice of sampling designs should take into consideration the fact that the spatial pattern of BPMV is highly clustered. Therefore, a systematic sampling design that employs multiple sampling arms is recommended over arbitrary or random sampling designs for this pathosystem (18,19). This is the first study to demonstrate that the temporal and spatial BPMV dynamics are greatly influenced by time of virus detection (related to time of infection) within a plot (or treatment). This is evidenced by the fact that BPMV was first detected in non-inoculated plots in 2006 and epidemic onset occurred 12 days before the time of epidemic onset in inoculated plots, whereas in 2007, BPMV was first detected in BPMV-inoculated plots and disease onset occurred in these plots 35 days earlier than epidemic onset in non-inoculated plots. This study also showed that the presence of an initial source of inoculum is important in BPMV epidemic progress. Plots that did not have an initial source of BPMV inoculum had lower final BPMV incidence. Thus, management tactics that prevent or delay initial infection have the potential to be important components of an integrated disease management program for BPMV (20). The importance of early season BPMV infection was more evident in 2007, when bean leaf beetle population densities were lower, and the rate of BPMV infection was also lower compared to 2006. Therefore, adding BPMV inoculum (point sources) in 2007 led to higher levels of BPMV incidence in inoculated plots. As theorized by Vanderplank, adding inoculum when the rate of infection is high, as was the case in 2006, did not result in higher levels of BPMV incidence in inoculated versus non-inoculated quadrats. The clustered spatial pattern of infected quadrats strongly indicates that BPMV spread was from quadrat-to-quadrat within field plots. Moreover, both the inoculated and non-inoculated plots had similar spatial patterns of BPMV-infected quadrats, indicating that it would not be possible to distinguish between naturally-occurring BPMV epidemics from those that were deliberately initiated by mechanically-inoculated soybeans in the field. At a county scale, there was nonrandom chance of BPMV occurrence among counties, indicating that some counties were at a higher BPMV risk than others. The increase in the incidence of BPMV from north to south indicates the existence of area-wide risk factors that may be associated with certain Iowa counties. These could be abiotic (i.e., environmental, e.g., temperature, snow fall, snow duration, etc.) and/or biotic (bean leaf beetle winter survival, seasonal population densities, presence of BPMV the previous season, seed sources, etc.) risk factors operating at a multicounty level. For example, a single abiotic risk variable (the number of days when average temperature was below freezing between October and April) accounted for 46.3% of the variation in BPMV incidence in 2006 (data not shown) (26). The results from the survey suggest then need for an area-wide BPMV management strategy for both soybean growers and seed companies. For example, seed production could be located in geographical areas of lower BPMV disease risk areas (northern part of the state), whereas soybean growers in the southern part of the state should apply an insecticide seed treatment in years when bean leaf beetles are predicted to be high (i.e., following mild winters). 1. Anjos, J. R., Jarlfors, U., and Ghabrial, S. A. 1992. Soybean mosaic potyvirus enhances the titer of two Comoviruses in dually infected soybean plants. Phytopathology 82:1022-1027. 2. Boethel, D. J. 1999. Assessment of soybean germplasm for multiple insect resistance. Pages 101-129 in: Global Plant Genetic Resources for Insect-Resistant Crops. S. L. Clement and S. S. Quisenberry, eds. CRC Press, Boca Raton, FL. 3. Bradshaw, J., and Rice, M. 2003. Bean leaf beetles: A current and historical perspective. Integr. Crop Mgt. 3-17. Dept. of Entomol., Iowa State Univ., Ames, IA. 4. Calvert, L. A., and Ghabrial, S. A. 1983. Enhancement by Soybean mosaic virus of Bean pod mottle virus titer in doubly infected soybean. Phytopathology 73:992-997. 5. Cihlar, C. L., and Langham, M. A. C. 2004. BPMV effects on yield and test weight of ten soybean lines. Phytopathology 94:S157. 6. Gergerich, R. C., and Scott, H. A. 1988. Evidence that virus translocation and virus infection of non-wounded cells are associated with transmissibility by leaf-feeding beetles. J. Gen. Virol. 69:2935-2938. 7. Giesler, L. J., Ghabrial, S. A., Hunt, T. E., and Hill, J. H. 2002. Bean pod mottle virus: A threat to U. S. soybean production. Plant Dis. 86:1280-1289. 8. Hill, J. H., Koval, N. C., Gaska, J. M., and Grau, C. R. 2007. Identification of field tolerance to Bean pod mottle and Soybean mosaic viruses in soybean. Crop Sci. 47:212-218. 9. Hobbs, H. A., Hartman, G. L., Wang, Y., Hill, C. B., Bernard, R. L., Pedersen, W. L., and Domier, L. L. 2003. Occurrence of seed coat mottling in soybean plants inoculated with Bean pod mottle virus and Soybean mosaic virus. Plant Dis. 87:1333-1336. 10. Hopkins, J. M., and Mueller, A. J. 1984. Effect of Bean pod mottle virus on soybean yield. J. Econ. Entomol. 77:943-947. 11. Krell, R. K., Pedigo, L. P., Hill, J. H., and Rice, M. E. 2004. Bean leaf beetle (Coleoptera: Chrysomelidae): Management for reduction of Bean pod mottle virus. J. Econ. Entomol. 97:192-202. 12. Krell, R. K., Pedigo, L. P., Hill, J. H., and Rice, M. E. 2003. Potential primary inoculum sources of Bean pod mottle virus in Iowa. Plant Dis. 87:1416-1422. 13. Krell, R. K., Pedigo, L. P., Rice, M. E., Westgate, M. E., and Hill, J. H. 2005. Using planting date to manage Bean pod mottle virus in soybean. Crop Prot. 24:909-914. 14. Lin, M. T., and Hill, J. H. 1982. Bean pod mottle virus: Occurrence in Nebraska and seed transmission in soybeans. Plant Dis. 67:230-232. 15. Madden, L. V., Louie, R., Abt, J. J., and Knoke, J. K. 1982. Evaluation of tests for randomness of infected plants. Phytopathology 72:195-198. 16. Mynre, D. L., Pitre, H. N., Haridasan, M., and Hesketh, J. D. 1973. Effect of Bean pod mottle virus on yield components and morphology of soybeans in relation to soil water regimes: A preliminary study. Plant Dis. Reptr. 57:1050-1054. 17. Nutter, F. W. 1997. Quantifying the temporal dynamics of plant virus epidemics: a review. Crop Prot. 16:603-618. 18. Nutter, F. W., Jr., Schultz, P. M., and Hill, J. H. 1998. Quantification of within-field spread of Soybean mosaic virus in soybean using strain-specific monoclonal antibodies. Phytopathology 88:895-901.
epidemics: A review. Crop Prot. 16:603-618. 20. Nutter F. W., Jr. 2007. The role of plant disease epidemiology in developing successful integrated disease management programs. Pages 43-77 in: General Concepts in Integrated Pest and Disease Management. A. Ciancio and K. G. Mukerji, eds. Springer Dordrecht, The Netherlands. 21. Pedersen, P., Grau, C., Cullen, E., Koval, N., and Hill, J. H. 2007. Potential for integrated management of soybean virus disease. Plant Dis. 91:1255-1259. 22. Pitre, H. N. 1989. Polymorphic forms of the bean leaf beetle, Cerotoma trifurcata (Forster) (Coleoptera: Chrysomelidae), in soybeans in Mississippi transmission of Bean pod mottle virus. Entomol. Sci. 24:582-587. 23. Reddy, M. S. S., Ghabrial, S. A., Redmond, C. T., Dinkins, R. D., and Collins, G. B. 2001. Resistance to Bean pod mottle virus in transgenic soybean lines expressing the capsid polyprotein. Phytopathology 91:831-838. 24. Ross, J. P. 1986. Response of early-and late-planted soybeans to natural infection by Bean pod mottle virus. Plant Dis. 70:222-224. 25. Slack, A. S., and Cardwell, K. 2006. NCERA200: Management strategies to control major soybean virus diseases in the North Central Region. Online. Annual Report, Nat'l. Info. Mgt. and Support System, Univ. of Maryland, College Park, MD. 26. Steadman, J., Robertson A., Byamukama, E., and F.W. Nutter, J. 2007. Relationship between percent mortality predictions for Bean leaf beetles overwintering populations and incidence of Bean pod mottle virus. Phytopathology 97:S110. 27. Steinlage, T. A., Hill, J. H., and Nutter, F. W. Jr. 2002. Temporal and spatial spread of Soybean mosaic virus (SMV) in soybeans transformed with the coat protein gene of SMV. Phytopathology 92:478-486. 28. Vanderplank, J. E. 1963. Plant Diseases: Epidemics and Control. Academic Press, New York, NY. 29. Ziems, A., Giesler, L., and Graef, G. 2005. Commercial soybean variety response to Bean pod mottle virus infection. Phytopathology 95:S118.